Rereading the Fantastic Four comics from the start. Writer-artist John Byrne serves up another Twilight Zone-style issue — one that must be seen to be believed. 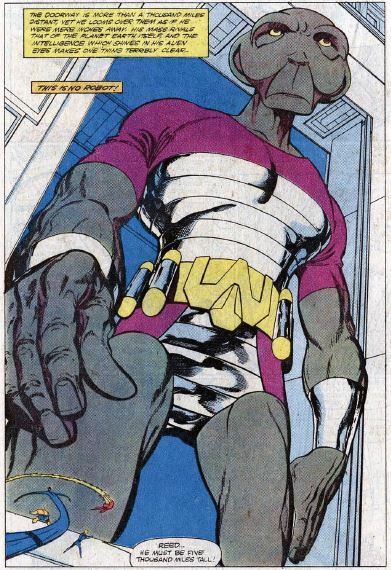 We begin with Triton, the Inhumans’ requisite undersea/amphibian guy, exploring an underground river, somehow on the moon. He arrives in a cavern, finding a mysterious glowing crystal. He touches it, and it blasts him with a powerful white light. From there, we cut to the Fantastic Four arriving in the Blue Area of the moon, the home of the Inhumans. The Inhumans are having a big party, and the royal family welcomes the FF in person. We’re told that the Inhumans have been hard at work making the moon their home after moving there from the Himalayas. The reason for the party, though, is that this is Naming Day, in which Crystal and Quicksilver announce the name of their baby daughter. 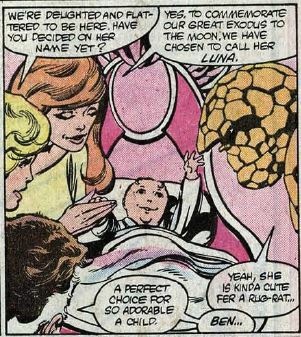 As appropriate for the first child born on the moon, they’ve named her Luna. Johnny and Quicksilver have a heart-to-heart, where Johnny says he’s glad that Crystal is happy, and that there are no hard feelings. The festivities are interrupted when a gravity disruption starts throwing everyone around the room. Get this: An unseen force has pulled the moon away from Earth’s orbit, and all the way out of the solar system. Then, an impossibly huge spaceship flies along and swallows the moon. Inside the craft, two mechanical arms hold the moon (the moon!) in place. Johnny does some exploring, and finds that the arms are slowly tearing off big pieces of the moon. 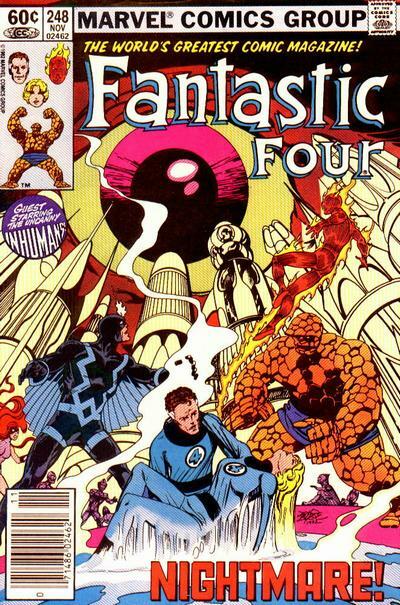 The FF and the Inhuman royal family use an Inhuman flying craft to leave the moon and explore the vast spaceship chamber beyond. Ben points out what looks like a door upon one wall, but Reed surmises that the entire ship must be automated because it would be impossible for a biological lifeform to grow big enough to occupy this space. Only he is proven wrong when the door opens and an alien the size of several moons walks casually into the room. Sue guesses that the alien is five thousand miles tall, and the caption tells us that it travels three thousand miles with each step. 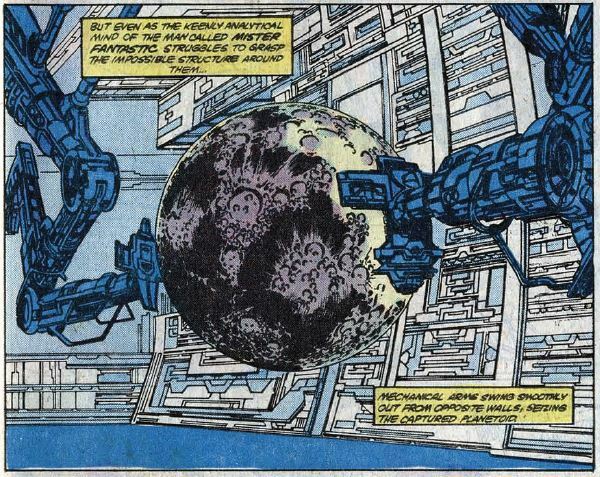 The alien inspects the moon, destroying part of the Inhumans’ city as his fingertips brush over it. Reed cannot believe anything he’s seeing, saying that any living creature that size would collapse under its own weight. He further has difficulty figuring out how Johnny flew around the massive room so quickly. The alien somehow notices this, and hilariously starts spraying the room with bug spray. Johnny tries using his hot-as-a-sun nova flame on the alien, only for the alien to swat him like a bug. Reed continues to fret about all this, saying there’s no way he could have seen Johnny get hit from so far away. Ben tears away a piece of the wall to get the alien’s attention, only for the alien to throw it and Ben over his shoulder. The caption says, “It will take him most of a day” to fall the five thousand miles to the floor. It gets even worse. 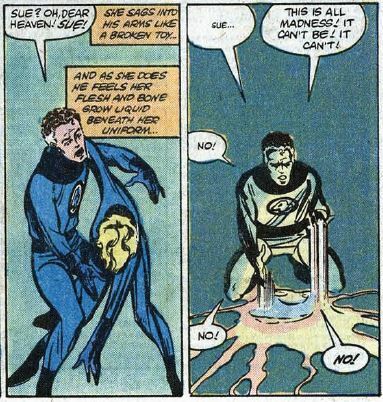 Sue inhales too much of the bug spray, and her body turns into water right in front of Reed. With everyone dead, Reed lets out a big dramatic “No!” Only to find himself back in the Inhuman city, as if nothing had happened. Yes, it was all a dream. Our heroes compare notes and learn they’ve all had horrific nightmares where they saw one another die. Reed says they may never know what caused the hallucination. Back in the underwater cavern, Triton recovers from a similar nightmare, suspecting that the mysterious crystal was left behind by some ancient alien intelligence with a hatred for anything that lived. The caption fills in the rest, saying Reed’s love for his family is what saved everyone from the crystal’s evil. Unstable molecule: It’s clever how Reed spends the whole issue nitpicking the scientific inaccuracy of what he’s seeing, before the readers can do the same thing. Fade out: Sue says that in her nightmare, she saw Reed murdered by Dr. Doom. Flame on: He admits that he still misses Frankie Raye, who left him (and the Earth) to the new herald of Galactus. Fantastic fifth wheel: Medusa’s status as an alternate member of the FF gets a brief mention. 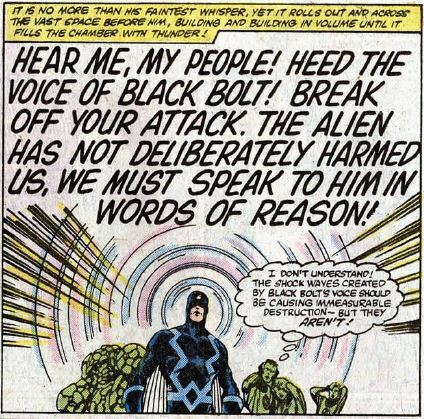 In her nightmare, she says, she saw Black Bolt die. 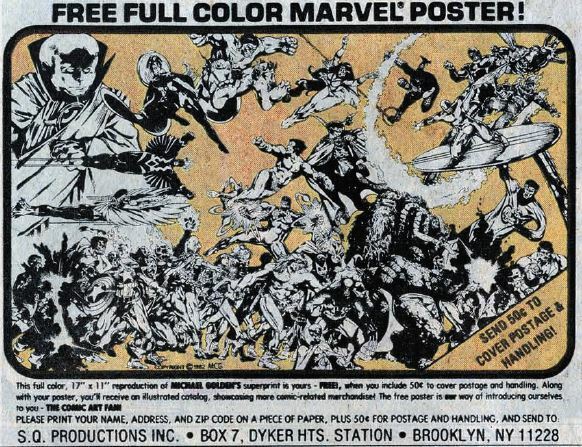 Commercial break: I always wanted one of these posters. Does anyone know if they were ever actually produced, or were these ads bogus? Trivia time: Because so many Inhumans have flying powers, their fleets of aircraft are kept in museums — but still able to fly if needed. Fantastic or frightful? I dislike “It was a dream” stories as much as anyone, but there’s still a lot to like about this issue. Byrne does an outstanding job of providing a sense of scale, so you truly believe that this alien and its ship can exist even though the size of it all is so mind-boggling. This is far-out space adventure at its most far-out. Next week: Man and Mohawk-man.